Here’s how Santa Spy Cam works.. Put your smart phone near the Christmas tree while no one is home like you’re setting up a surveillance camera and “capture” the elves (or Santa himself) making mischief in your home using live-action video capability and customization options. There are up to 52 spy scenes you can use as PROOF that Santa or his elves were in your home. The look on kids’ faces is PRICELESS when they they’re shown the “evidence” that your smart phone captured! The reviews of Spy Cam are heaven or hell. Many users giving it one star complain that the minor updates make you have to repurchase the app entirely if you’ve already downloaded previous versions. The five-star reviews love the new additions to the app – like being able to integrate physical objects onto a scene and the addition of 15 new spy scenes. One thing is for sure, previous versions of this app we’re a lot easier to use and you received a lot more features for FREE than the newer versions. The new versions are often described as buggier with many complaints about the price. But, if you’re new to it and weren’t spoiled by the previous versions. The features of this app will likely amaze you. 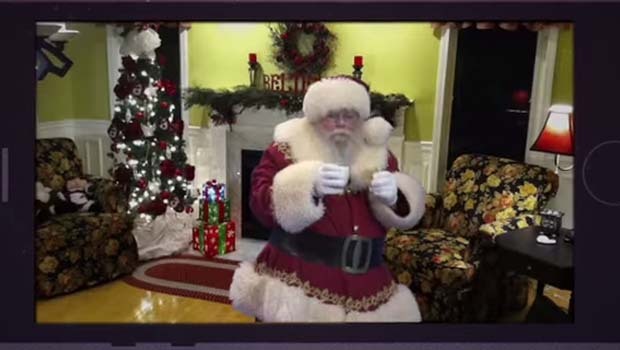 Santa Spy Cam is available for Apple and Android.